Home Dairy Free dairy free products Divvies Dairy, Nut & Egg Free Cookies Giveaway! 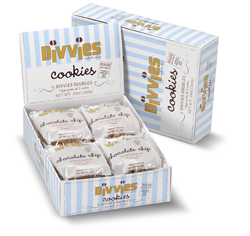 Divvies Dairy, Nut & Egg Free Cookies Giveaway! UPDATE: The winner is [email protected] Congratulations! When I learned I was going to have to give up all dairy, I missed desserts the most—pies and crumbles, lemon bars, ice cream, cookies, the list goes on and on. I imagine an allergy or intolerance is even harder on a child who is not able to eat a friend’s birthday cake or the treats brought to school. Benjamin Sandler was one of those kids. He can’t eat anything with even a trace of peanuts, tree nuts, milk or eggs. His mom spent quite a bit of time in the kitchen concocting items her son could enjoy and looking for treats that would satisfy not only her son, but all of his friends. She succeeded, and from her success was born Divvies—made to share. “ Divvies fun-foods are available to share with families and friends across the country. Divvies cookies, popcorns, and cupcakes are made in the company’s-own dedicated facility where no peanuts, tree nuts, eggs or milk enter the doors. Divvies candies, frosting, and sprinkles are certified by their manufacturers to be peanut-, tree nut-, milk-, and egg-free and are packaged in Divvies Bakery. Divvies conducts routine testing to minimize the risk of any cross-contamination in their certified allergen-free ingredients. I was recently given a chance to try Divvies chocolate chip cookies, and I and my whole family can attest to their delicious taste. My husband, who doesn’t eat very many sweets, loved them! They are so moist and packed full of chocolate chips. Best of all, you can’t tell that these are cookies made without traditional cookie ingredients. In fact, they are better than many cookies I have had. Divvies has generously agreed to supply one lucky winner with a box of Divvies Doubles—24 delicious cookies delivered right to your door. To enter this giveaway, simply go to Divvies and then leave me a comment stating which flavor cookie you would like to receive should you win. This contest will end on Monday, September 6th. The winner will be chosen via random.org. Make sure you include your e-mail address when you enter. I received one box of Divvies cookies for review purposes. Thanks Divvies! I received no other compensation from Divvies for this giveaway. I would love to try the Choco-lot brownie cookies. Chocolate chip, my life-long favorite! I would love to receive the molasses ginger cookie if I win – but really, a variety box would be even better! I'd love to try all of the flavors. I would love to try the Choco-lot Brownie Cookie. I would choose the oatmeal chocolate chip, but they all look good! I follow on gfc and google reader. Oooh! The choco-lot brownie cookies look amazing!! i'd love to try the choco-lot brownie cookies! i like divvies on facebook! my facebook name is cheryl cain eash! I would like to try the Choco-lot Brownie Cookie. I'd love the oatmeal chocolate chip cookies! Best of both worlds (chocolate AND oatmeal cookies)! The Choco-lot cookie would definitely be my choice! I'd choose the sugar cookies. I'd like to try the Choco-lot Brownie cookie, but wish they had a mixed box, so I could sample all the flavors! I'm a follower in GFC! I would like the Choco-lot brownie cookies. I liked Divvies on facebook as Amelia Designe. I follow you at twitter as BedeliasSpot. I'd like to try the oatmeal chocolate chip! Yum! Thanks for the great giveaway! I like Divvies on face book! Oatmeal Chocolate Chip sound great!! I would love to get chocolate chip for my niece who is on a dairy and gluten free diet! I liked divvies on facebook! Emilie P.
Oh man!! I would get chocolate chip! I am known as Cookie Monster in our house and I am not the child! Mmm. I bet DS would love the choco-lot brownie cookies! Egg free! YAY! I would love Oatmeal chocolate chip. I would like chocolate chip. The Oatmeal Raisin look yummy. I am facebook fan of Divvies. I would love to try the Choco-lot Brownise Cookie. I'd like to receive the Choco-lot Browning Cookie Doubles. I would love to go the traditional route & try the Chocolate Chip Divvies first. I'd love to try the Chocolate Brownie flavor! I would love to try the Chocolate Brownie Cookie. I am a fan of Divvies via Facebook as Jill Myrick. Chocolate Chip, of course! Thanks! Hard to decide between the Chocolate Chip and Raisin Oatmeal. Hi, I'd like to receive the choco-lot brownie cookies! I like Divvies on Facebook (FB name: Maddie Brubaker). I would love to try the molasses ginger cookies. I would like the oatmeal chocolate chip. The Choco-Lot Brownie Cookie would be my choice! Let's start with Molasses Ginger. I'd like the molasses ginger. Hmmm, either chocolate chip or oatmean chocolate chip. Yum! I think my family would enjoy the Choco-lot Brownie Cookies. Thanks for the review and giveaway! I'd like to try the choco-lot brownie cookies! My son would love the oatmeal chocolate chip! I would love to try the Choco-lot brownie cookies, thanks! I would have to go with Oatmeal Chocolate Chip. They look incredible. I also follow you. Thanks for the giveaway! The Sugar cookies would be the flavor of choice should I win. Thanks for the giveaway!! Nice to see new companies and wesites.